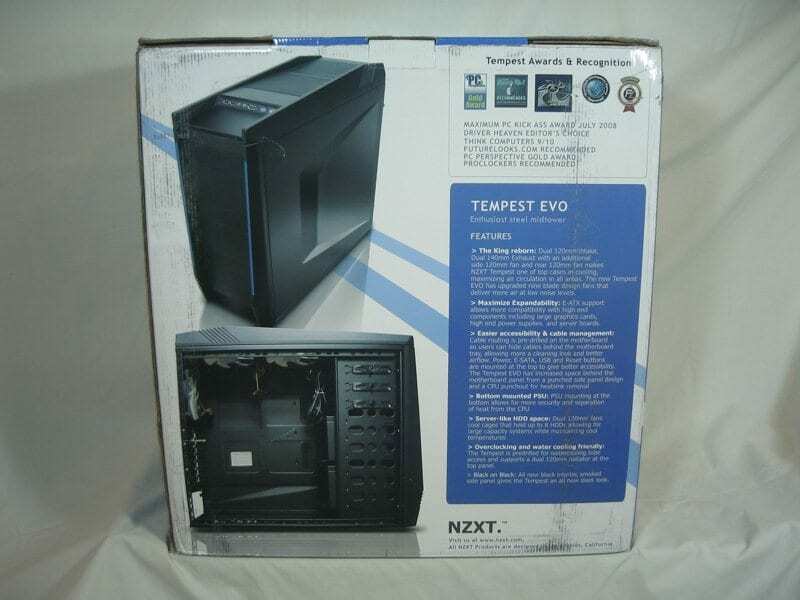 Their Tempest EVO we’re looking at today certainly sounds like a case that puts the consumer first. So sit back and let’s have a look to see if they’ve come up with something out of a gamer’s dream. Overclocking and water cooling friendly: The Tempest is predrilled for watercooling tube access and supports a dual 120mm radiator at the top panel. Black on Black: All new black interior, smoked side panel gives the Tempest an all new sleek look. Looks to be a pretty good case so far! It arrived like other cases before it, shipped as if it were purchased from the store, sans additional packaging. 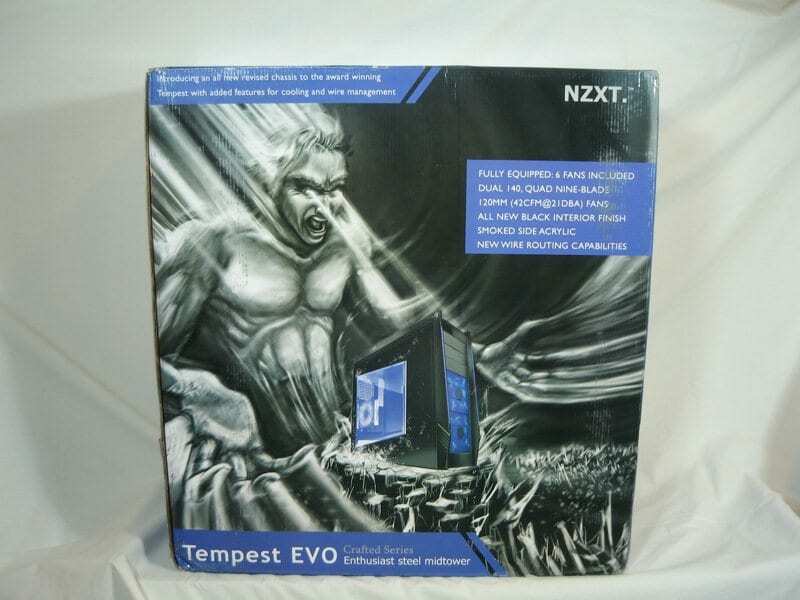 The front of the box appears to be a tempestuous image of Zeus (or a similar god-like creature) that appears to be somehow making the case with its eyes. Don’t show this to small children folks, it might just scare them. 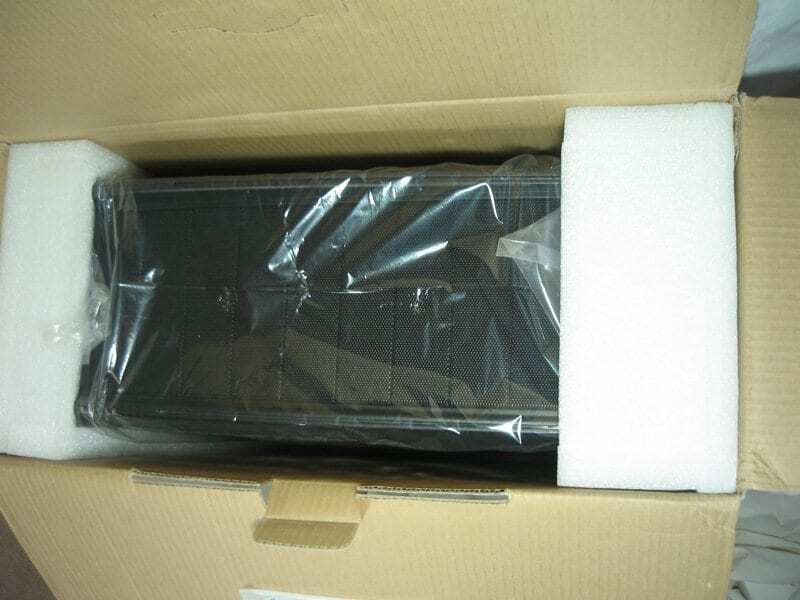 The back of the box logically shows us the back of the case as well as a photo of the internals, outlining the features. More detailed specs are on the side of the box. Opening it, we see a case packaged as most cases are. It’s wrapped in protective plastic with styrofoam keeping it from moving in transit. A tried and true method of protecting the product, there is no reason to reinvent the wheel here. 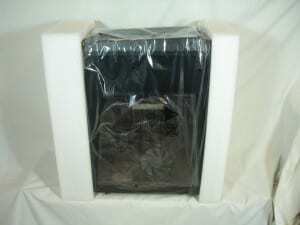 The case features a transparent side window, which was well protected with slightly adhesive saran-wrap-like material. After pulling the film off we see the crux of this review. A good looking case for sure. The sharp edges are a little reminiscent of the 1980’s future, but it seems to work for the Tempest. It’s nice to see a side window to show off the surely decent system that would go into an enthusiast case. The right side of the case is typical for what you’d expect the cover behind a motherboard tray to look like. It is painted with the same matte black finish we see throughout on metal parts of the case. The front panel is nice and uniform. While some cases go with a few 5.25″ drive bay-sized covers and then a larger, similarly perforated grill for the rest, NZXT has chosen to go with identical covers top to bottom. There is definitely some appeal to the fully modular design, even if it’s not that functional of an option. 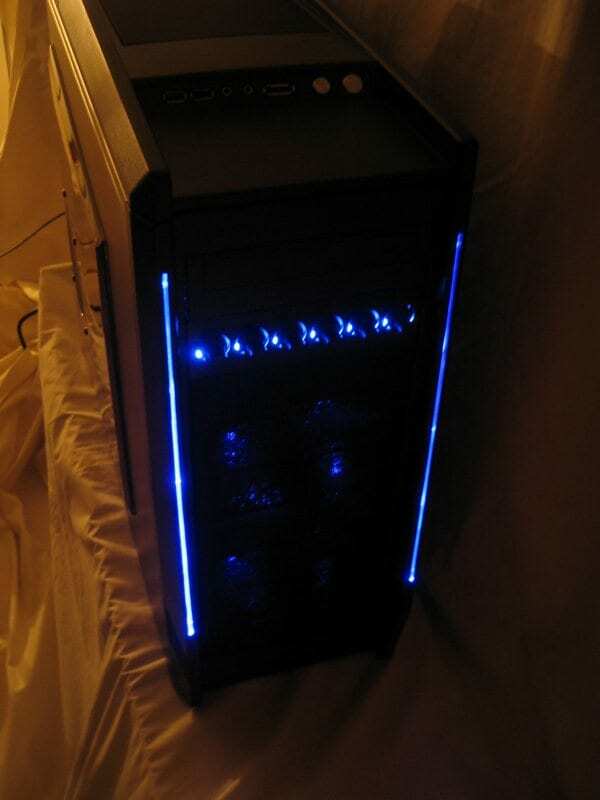 The slender indentions on the left and right side are actually blue LED strips that shine when the system is powered on, assuming you want that feature and plug it in to a MOLEX connector on your power supply. That’s not something you see on every case. We’ll see how it looks later. 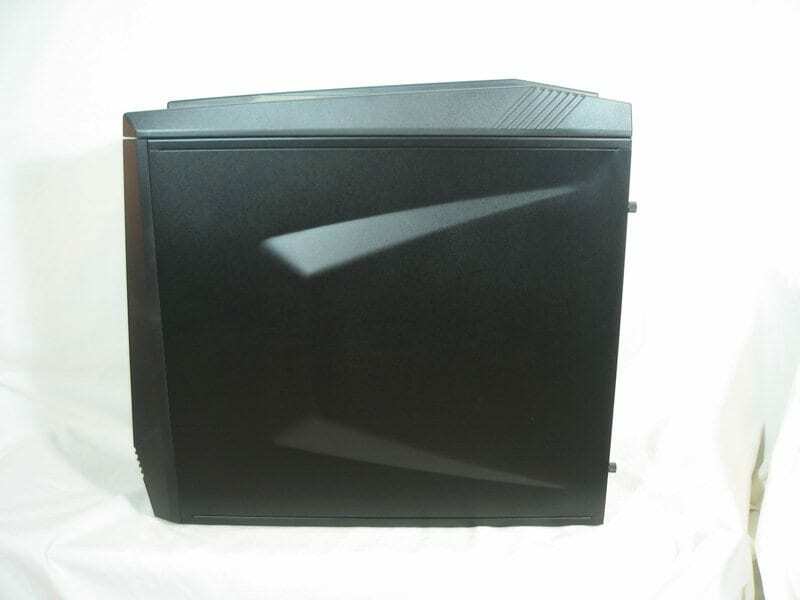 Moving to the rear, you can see NZXT’s choice of color for the fan blades in the fans throughout the case is white, a nice contrast to the standard black-on-black that you see in some black painted chassis. The I/O plate is standard fare and sized for pretty much every motherboard from mATX to EATX. There are the standard seven expansion slots. NZXT was smart and made these mesh for even more easy airflow. 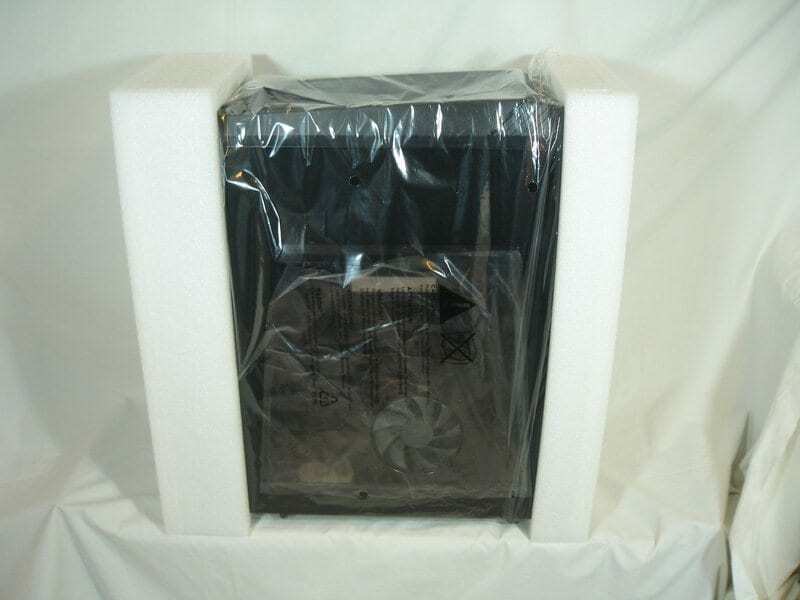 Speaking of mesh, their fan grille mesh is nice and large for good air flow while still keeping small fingers safe. There are four holes for water tubing for the water cooling crowd. Why you would actually need four is a good question. Not many people (do any?) run tubing out, then in then back out and in again. It’s just not logical. But I guess having two more in what would otherwise be just more mesh isn’t a bad thing, just slightly odd. After pulling the windowed panel off, we find a nice black-painted interior. It’s refreshing to see more and more manufacturers going with painted interiors. Once you see one of these, it’s hard to go back to plain old steel. Of course it means you have to be somewhat careful building your system and take care not to scratch things. They even placed the ends of the wires from the front I/O and switch panel in a cloth bag to ensure they didn’t scratch the case while being transported. All case accessories were handily mounted in one of the HDD bays just like a HDD would be. Nice touch! Thankfully the finish on the NZXT isn’t extremely fragile. A screw or two were dropped when installing the system with no ill effects. Just don’t drop a screwdriver business-end down and you’ll be ok.
You can also see NZXT kindly supplied grommets for cable routing behind the motherboard tray. On the 5.25″ bays are tool-free mounting brackets for holding your 5.25″ devices in place. Moving around the interior we find NZXT has kindly filled all of the fan holes in their case. This is a split from some cases, where they’ll throw in a couple fans and the rest you’re on your own to fill. 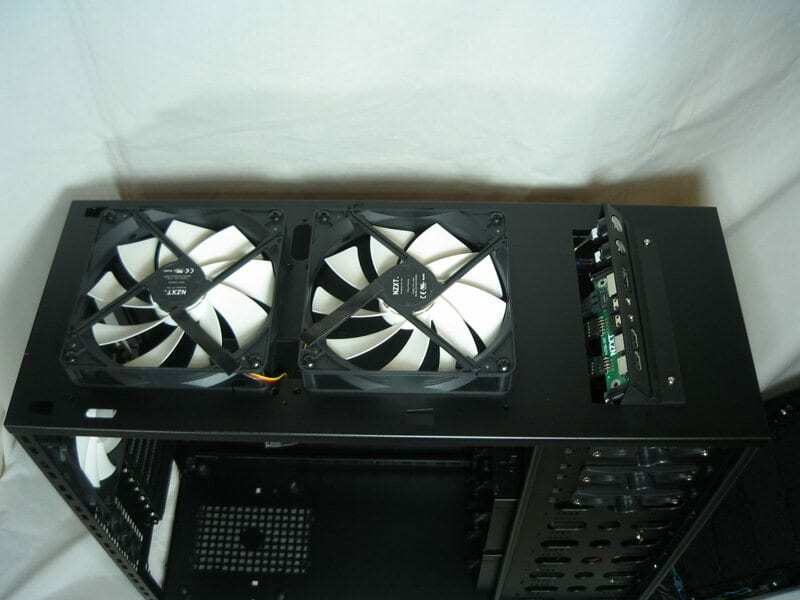 Not only is this great for the consumer in that they don’t have to purchase additional fans, it keeps the look of the case uniform throughout with the same striking white fans. There are no less than six fans populating the case – one 120mm in the rear, two 140mm on the top, two 120mm in the front and one 120mm in the side. 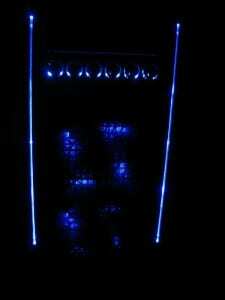 The latter three are equipped with blue LEDs. 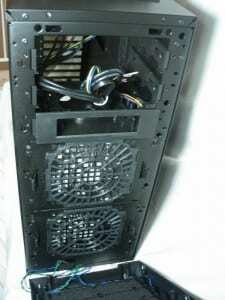 The HDD bays are oriented similar to a server. There is enough space for eight (yes, EIGHT) 3.5″ drives. For a mid-tower -for any case really- that’s a lot of drives! There are positives and negatives for the way they designed the HDD mounts. A huge boon is that the front 120mm fans could not be more optimal for HDD cooling with nice, cool, room temperature air. There is more airflow available to cool the drives than in cases with the drive cages mounted perpendicular to this setup. The down side to this improved cooling solution is that the orientation is far from ideal for those who care strongly about wire management. It can be tamed somewhat, but you’ll always see power & data cables on the back of your drives. One quick but important note: the case does not ship with accommodations for a 2.5″ SSD drive. 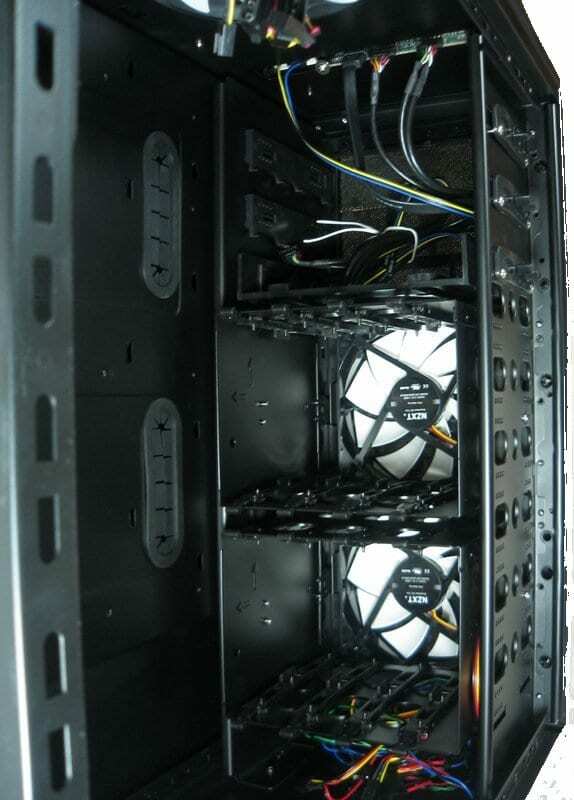 Looking at the bottom of the interior, we find the (bottom-mounted) PSU mounting area. 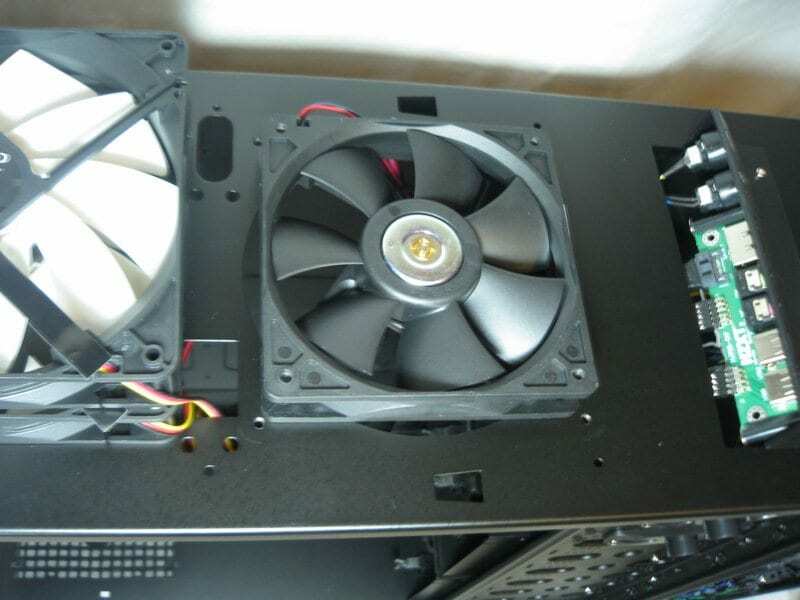 There is a filtered air intake that’s not quite as large as most power supplies’ fan. 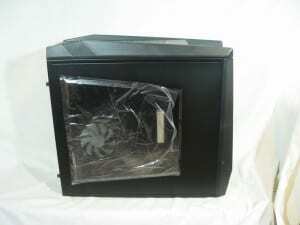 Fortunately the rubber mounting posts serve to help by floating the PSU above the bottom of the case, so it draws air from both this filtered inlet and from inside the case itself. Turning the case around reveals the back of the motherboard tray and the other side of the HDD & ODD mounts. 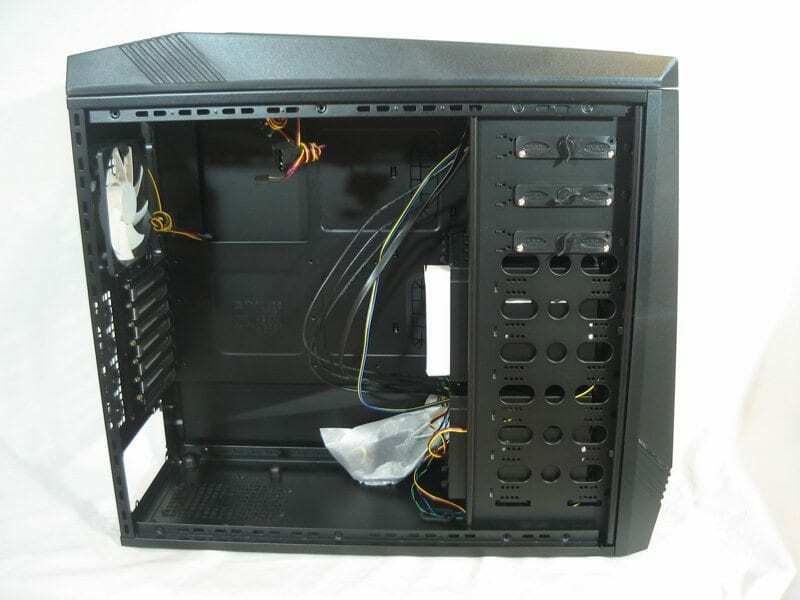 There is a nice sized hole for convenient cooler mounting without removing the motherboard. As a lot of cases with tool-free 5.25″ mounts go, these do not have a mounting bracket on this side. there is not anywhere to hide power cables cables immediately when they exit the power supply. They can be hidden under the HDD racks as you’ll see later, but it leaves visible cables where there otherwise might not need to be any. 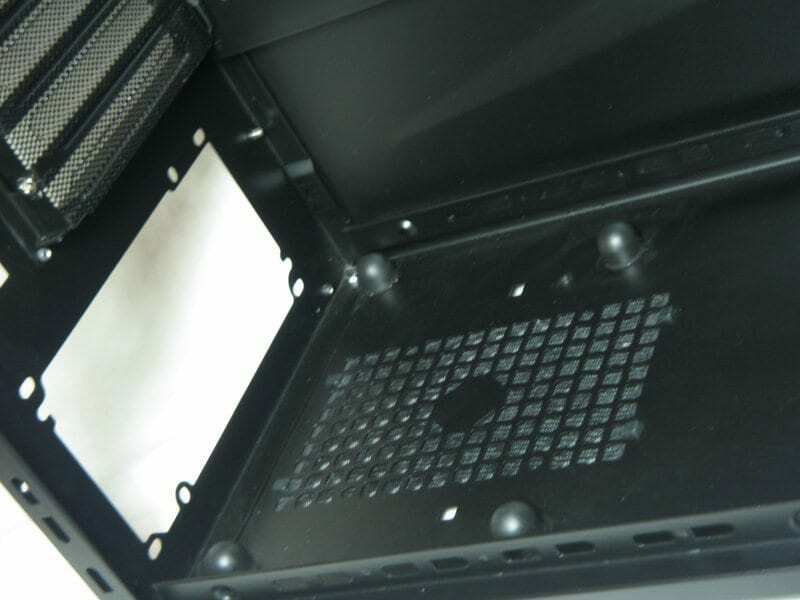 if you look behind the ODD / HDD mounting racks, there are holes in the MB tray. There is a gap between the tray and the racks themselves. This makes it somewhat of a nuisance to place screws in the proper places. Not a deal breaker, but definitely something to note. You’ll want to have a magnetic screwdriver bit to save yourself some agony. Only a couple more things and we’ll move on to actually using this thing. Pulling the front panel off exposes the filters for the front intake fans. These will need to be cleaned occasionally, but it’s nice to have them to help keep your system dust-free. They slide out of their mounts easily without needing any tools. The top panel is rather a pain to remove. There are two screws in the front of the case and six tiny screws in the top inside the case. This is another place you’ll want to use a magnetic-tipped screwdriver, especially if your system is already installed. Both the features list on NZXT’s web site and the box say that you can mount a dual 120mm radiator in the top of this case. Alas, this is one of the biggest disappointments for water coolers, and why the system installed today is air cooled only. In this photo, you can see the problem. There are, in fact, holes to mount two 120mm fans. You can see them to the left of the 120mm fan placed on there. However, there are no holes for use on the other side of the fan. Not that it would make a lot of difference for one of them, considering the fan would be floating out in space over the middle of the 140mm fan mounting hole. Let’s pretend for a second you really did want to mount a fan with only two screws in it. The panel on the case covers up at least a third of the fan! So now you have a somewhat precariously mounted fan. Who in their right mind is going to mount a radiator using only the four screws in the middle? For what good it would do, you could put a screw through the fan corner floating over the gaping 140mm hole. 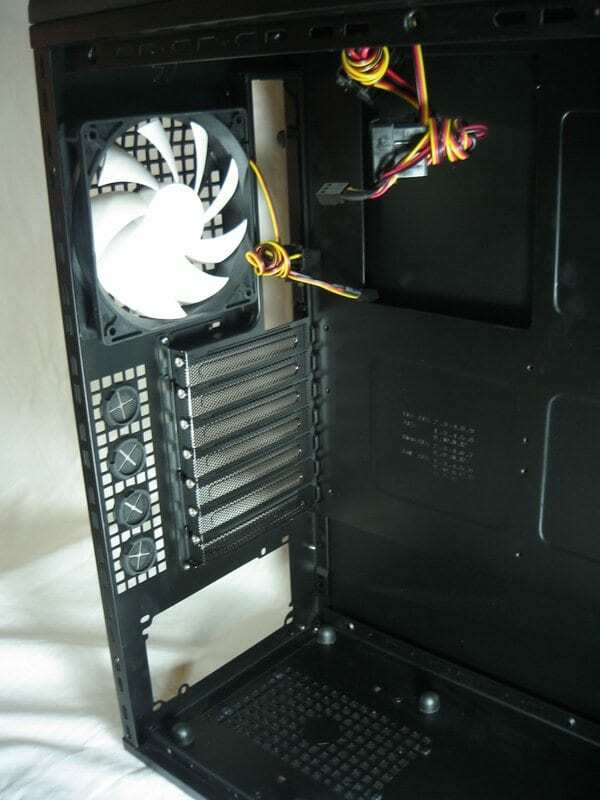 Did I mention that the case covers at least a third of the fan, completely preventing a good bit of air flow? 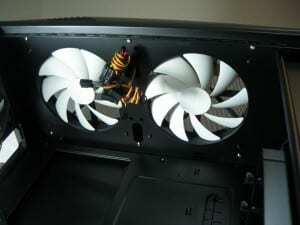 You may be able to fit a dual 140mm radiator up there, but it will be tight and the screw spacing is more than likely going to be too wide, meaning some customization would be in order. The space between the top panel and the board is slim and most 140mm radiators are thick. That could very well cause issues, so take measurements and be conscious of your radiator’s depth. 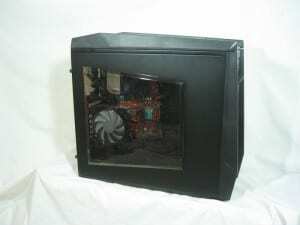 So no, this is not necessarily an internal water cooling-friendly case. 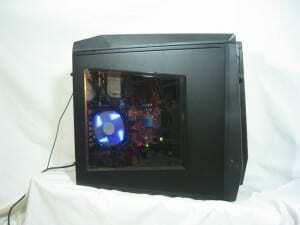 However, water cooling is a moderately small part of the market. 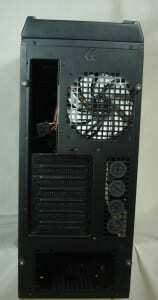 The airflow through this case with the included fans is absolutely superb. This is most definitely a good case for people using air cooling. Enough with the bare case though, let’s get a system put in! The system being installed is a little long in the tooth but works great for exploring installation and wire management abilities of a case; it even comes complete with the bane of wire management – an IDE cable. Installing the system was painless and easy. 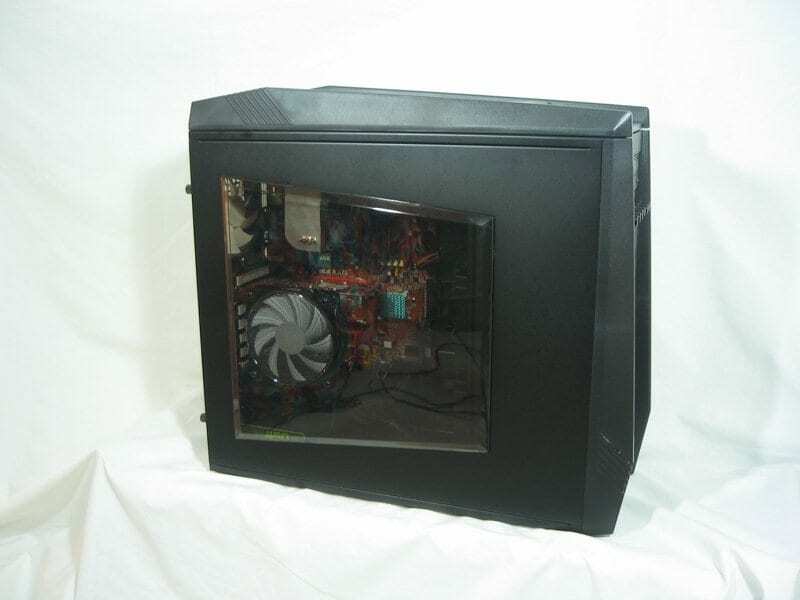 The case is roomy enough and has plenty of space to work with. Wire management was reasonably easy to accomplish. 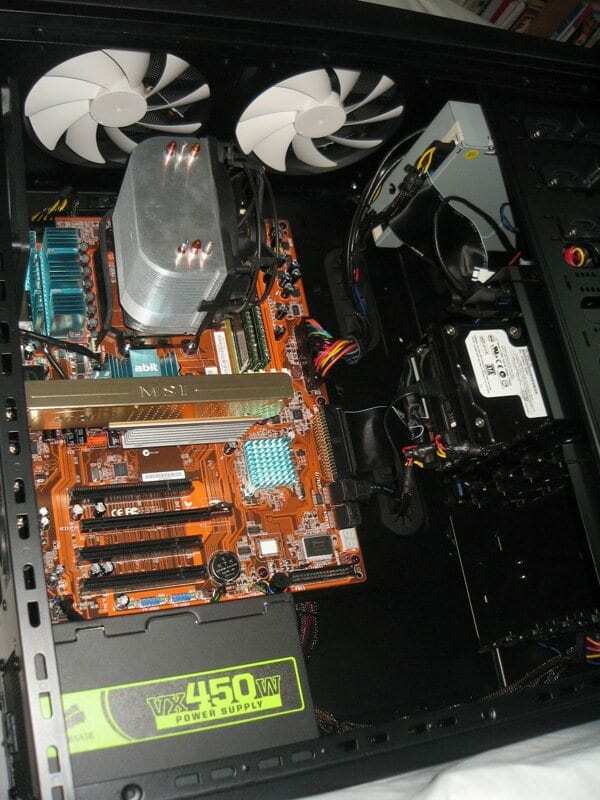 The rubber grommets in the motherboard tray are a bit finicky and like to try and come out. Something a bit more stiff may be in order in the future. It’s very nice to see the wires coming off of the front I/O and switch panel have mostly dark colors. That helps make for a cleaner interior. Unfortunately they didn’t do this with the fan cables. They’re an excellent length to reach where you need them – 20″ each, but they’re rather bright colors. Thankfully, a little painless electrical tape can clean that right up. Those of you with more time may consider sleeving them. It would be nice if they were sleeved from the factory though, or even a darker color scheme on the wires. A couple more install comments and we’ll see how this thing turned out. The front panel blanks are very simple to remove and install. The tool-free 5.25″ brackets, like most of their ilk, are only good for larger things like ODDs. 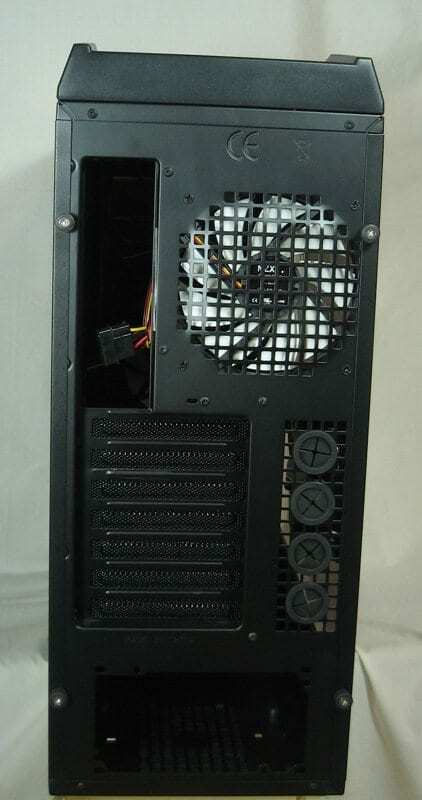 Fan controllers will need a screw inserted on the other side to keep them stable. On that same token, those same tool-free 5.25″ brackets in this case are not the best design. They’ll work, but only after playing with them and probably removing one to find out just how they work so you know which way to turn the thing and where it should stop. The PCI/PCI-e blank screws are silver for some reason. Black would be much more preferable in an all-black case. The thumbscrews to mount the side panels are less thumbscrews and more screws put into a piece of plastic to make them seem like thumbscrews. They work, so it’s not a functional problem, but real, all metal thumb screws would be a better solution. That’s it, let’s take a look! Now, let’s close it up and see how it looks! Well, there you have it. The NZXT Tempsest EVO has its plusses and minuses, but overall is a winning case, especially for those of us that air cool our systems. Painted all black, inside and out. 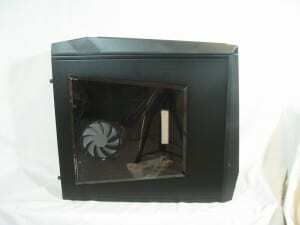 All cooling fans (2 x 140mm and 4 x 120mm – three of which are equipped with LEDs) are included. Side window (complete with dark tint, a nice touch). Filters for intake fans and the PSU intake. Will not fit a dual 120mm radiator internally as advertised…at least not practically with good airflow from the fans and secure mounting for the radiator. PCIe/PCI bracket screws are silver instead of black. 5.25″ bay tool-free mounts could be improved. 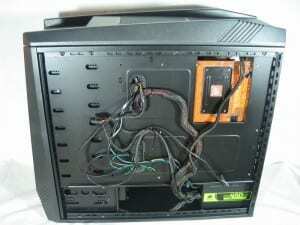 Wire management grommets need strengthening. Fan cables would benefit from sleeving. HDD wire management is difficult due to bay orientation. 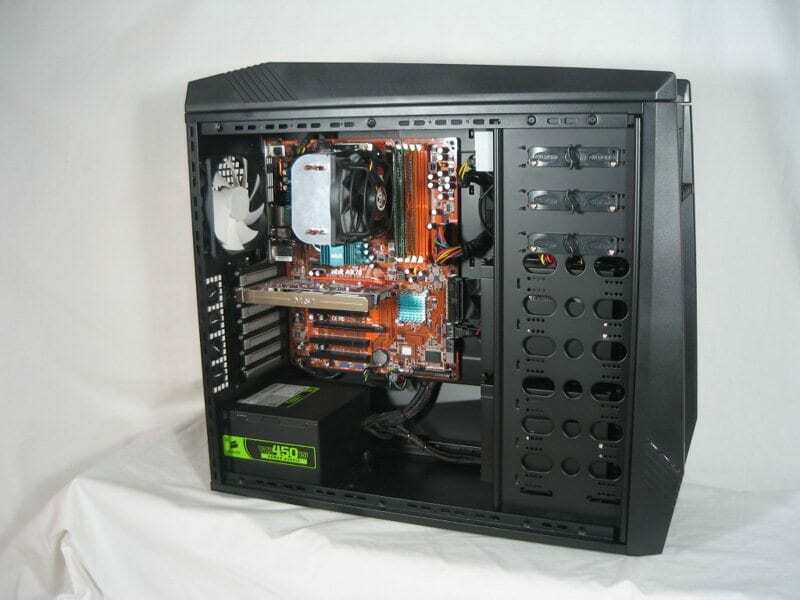 If you use air cooling, there is no doubt you will be pleased with the performance this case offers. 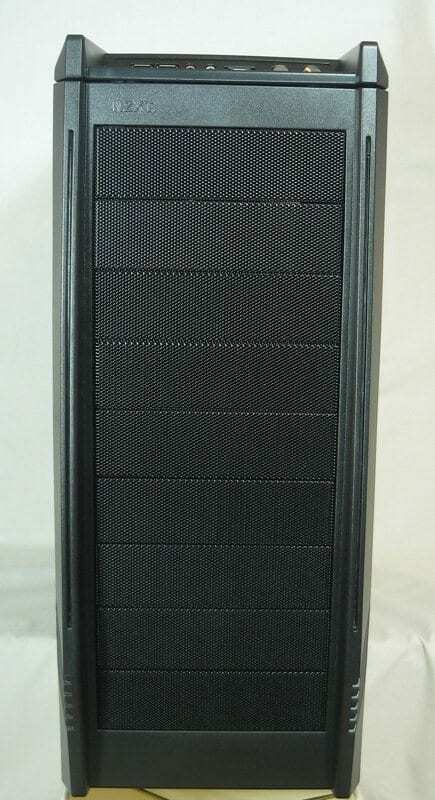 Likewise, if you use a lot of hard drives and want a mid-tower case, this one is hard to beat. It also looks great, even if a little sharp and 80’s-tastic. 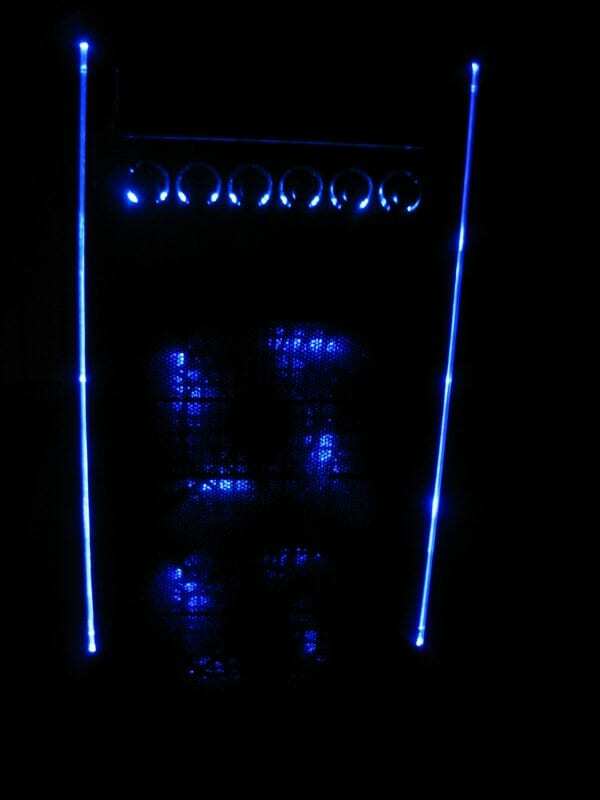 It’s definitely a great way to show off your system, with just enough bling to be tasteful but not enough to be gaudy. 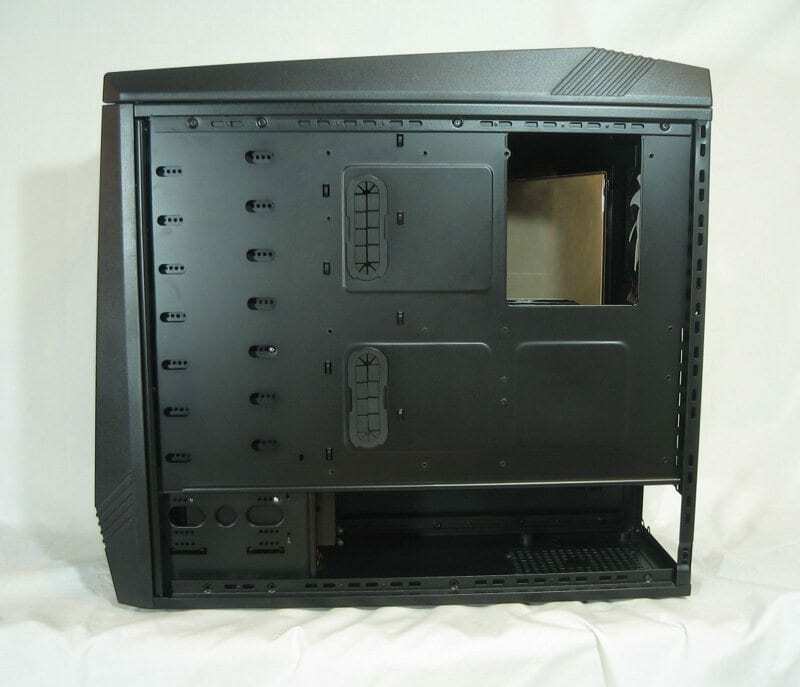 There are many, many worse things you could do with $109.99 (regularly $89.99 with mail-in rebate as of 4/3/10 at Newegg) than purchasing this case. 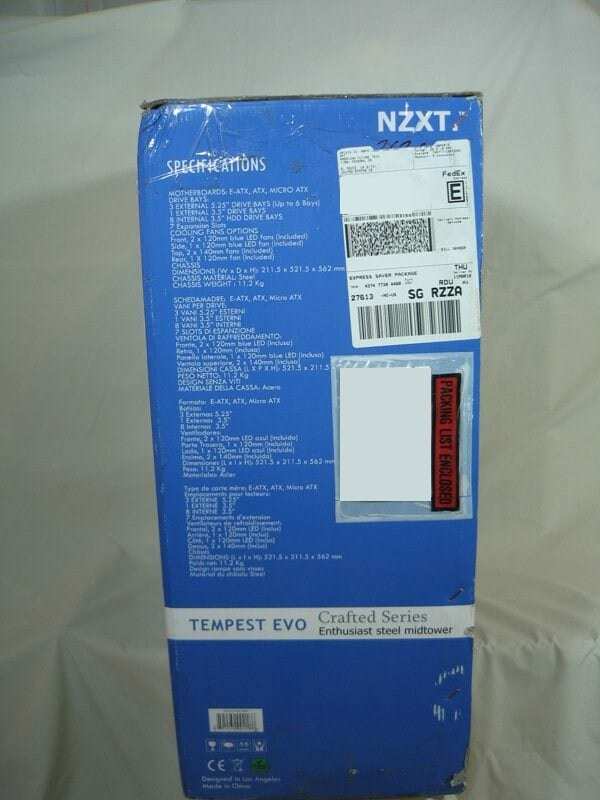 Water cooling enthusiasts that want an internally radiated solution should look elsewhere, but for everyone else, the NZXT Tempest EVO is most definitely Overclockers approved! 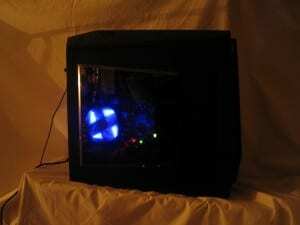 Previous Article Overclockers.com Benching Team SuperPi Competition! I know someone who has this case and it amazes me every time I see it in action. 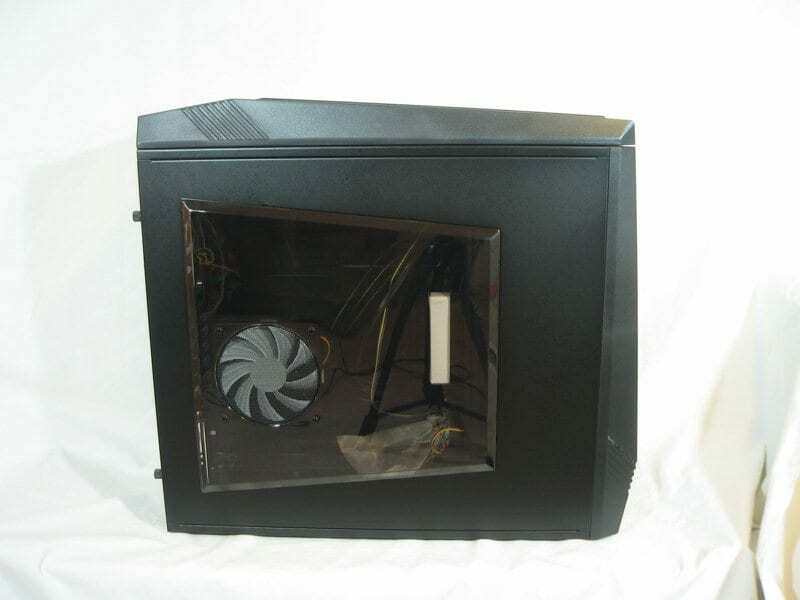 The airflow easily rivals that of the Antec cases. 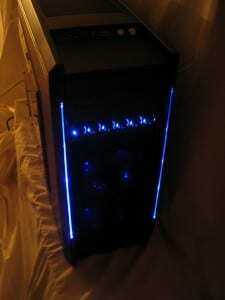 By the way, this case is also what made me an NZXT fan. I bought my NZXT M59 only a few months after my friend bought this case. NZXT all the way! 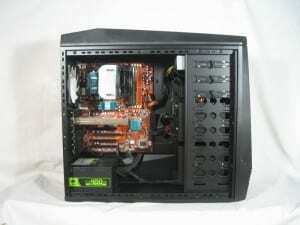 looks too much like the antec series with half the wire management capability. If I didn't already own an antech that case might be a consideration but certainly not worth swapping brands. Tempest did copy Antec design for a lower price. I still have the original Tempest. 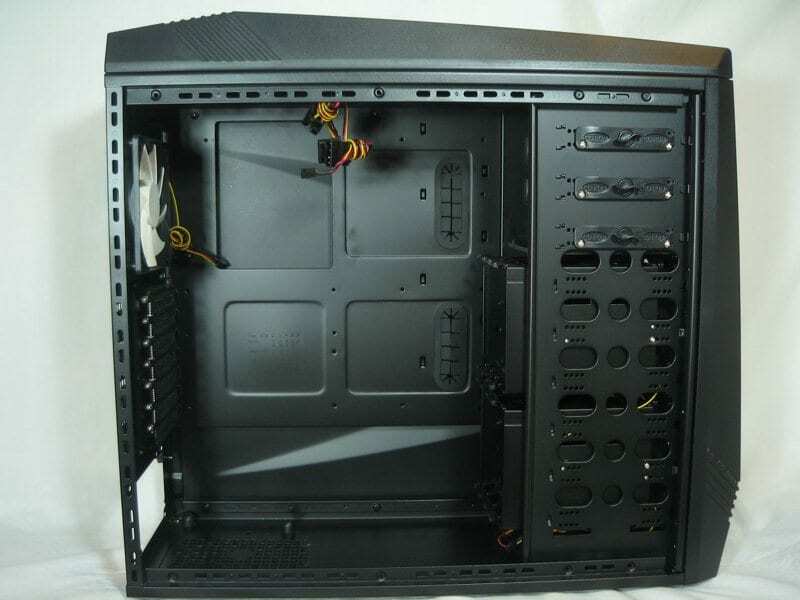 EVO improved cable management behind mobo tray, a cutout in mobo plate for changing heatsink without removing mobo, changed the PSU support a bit, and an all black interior but they are largely the same. Actually it's not that difficult to add the Black Ice® GTS Gen Two Xtreme 280, which is a dual 140 radiator to the NZXT Tempest EVO. A little dremel work around the fan openings and redrilling a new bolt pattern--done. 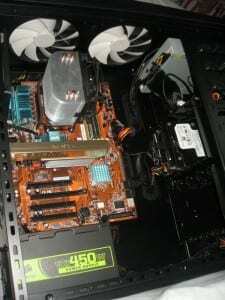 Before the EVO version it was a little more involved to get the clearance between the radiator and the heatsinks at the top of the motherboards. It didn't take me too long to do the mods, about an afternoon was all. Looks very nice, thanks for the input! In the review, I wanted to relay what it could do without modification. Any case can be modified to do what people need it to (granted they may be a lot harder than yours). My take was 'what can it do out of the box?'. Unfortunately placing an internal radiator with sufficient mounting isn't one of those things. For water cooling, the RC690 II Advanced remains the mid-tower case to beat in my book. However, I am still a big fan of the Tempest EVO overall. The visible hard drive wires irks the wire management freak in me, but that's a small concern. 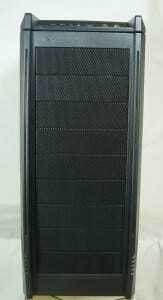 For any air cooler or someone with a boatload of HDDs, this case is most definitely a winner! Not sure about the Zalman, but it's currently housing a Thermalright Venomous X without issue. Looks like there may even be a centimeter to spare between it & the side panel.